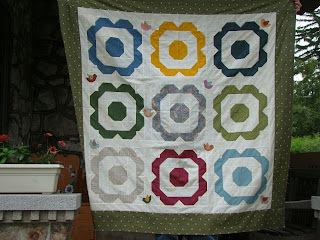 This is a new sample called Itty Bitty Blooms by The Pattern Basket. It was quick and easy to put together. I love the small flowers and the scallop border. It was designed for charm packs, but I used 6 different colors and had them repeat into diagonal rows. I really like the effect. 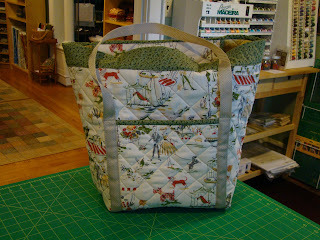 One of my customers made this grocery tote using fabric called Ooh-La-La from Andover. She used an insulated lining which will help keep cold foods cold. What a great idea! It looks great Sue! We just got in the Accuquilt Go Cutter. It is fabulous! I love cutting the half square triangle blocks with it. If you layer right sides together of your fabrics and then cut, you will have them stacked ready to go and they even have the dog ears already cut off! It doesn't get much better than that! This is a sample in the works using the go cutter pattern that comes with the cutter and die. I will post a picture when it is completely finished. Melissa just finished the sample Beautiful Blooms! It's great! I love the birds! I just finished designing a new quilt called Oriental Spice. I have both the pattern available and also kits. I used my embroidery machine to stitch a butterfly in the center. I love it! I'm trying to use my embroidery machine more for finishing touches on some of my quilts. 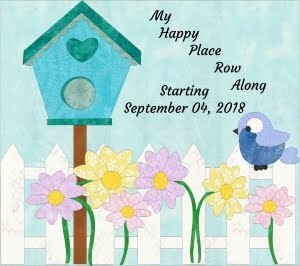 We are starting a new adventure in blogging! We hope that you will enjoy our posts and pictures. We hope to keep you up to date with all the happenings at the shop! 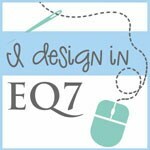 I hope you enjoy some of the pictures of the shop!